Everything that you could ever need to know about coloring you hair in one post! That's right folks! Learn everything from professional jargon and chemical processes, to ways to prepare for and care for your new color. Most professional hair color uses a numbers and letters system. The numbers (1-9) represent the level (or lightness/darkness) of the hair. 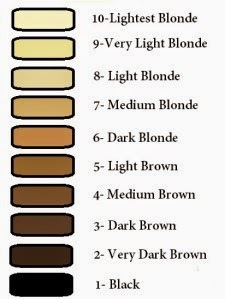 Those numbers represent everything from black to lightest blonde where 1 is the darkest and 9 is the lightest. The chart on the right has the levels listed with pictures of their respective color in a neutral tone! The second part of the color formula that professionals use is one or two letters. All of these letter stand for something. Typically they are simple to understand. R is Red, G is Gold, B is Brown, N is Neutral, A is Ash (or gray), T is Titanium, V is Violet, and C is Copper (a mixture of red and brown that is a little more on the orange side). While these are the basic letters, there are several others, and many brands and lines use different terms altogether. So if your stylist is using a 4RB on your hair it is a level 4 (medium brown) Red Brown. Have you ever lightened your hair and it looks yellow or orange? There is a way to get rid of that unwanted tone! If you have to much yellow, add purple into the mix! Combat orange tones with blue. If your hair is feeling a little red use green! Overall purple shampoos will tone out warmth, but using the proper color will speed up and enhance the process. 3- How Does it Work? When you color your hair, your hair dresser uses a combination of hair color and processing solution. The processing solution lifts the cuticle layer of the hair and allows product to penetrate the hair shaft. It also softens the color pigments in your hair. The hair color eats away a portion of the pigment in your hair and then replaces or covers the pigment with a new color molecule. When Lightening (or bleaching) your hair the processing solution works the same way. The lightener (or bleach) eats away the whole color molecule that lived inside your hair strand and needs extra lift from the processing solution to do so. This is why it is more damaging to your hair than coloring it. Do not wash your hair right before going into get it colored. Do not use box color! Go to a school if you are trying to save money. Do not lie to your hair dresser, if you use suave shampoo or have used box color we need to know! Redken has (in my opinion) the best post color hair care! There gentle sulfate free and low sulfate formulas are great! Talk to your hair dresser about what she recommends, but please stay away from drugstore brands like Garnier Fructis! And as much as I hate to say this I super don't recommend TIGI's color care line (Color Goddess). It is heavy and waxy, and I personally don't like anything about it except the smell. Why is Box Color so Bad for your Hair? What Hair Color will Bring Out my Eye Color?